It is so much fun to play pretend...and even more fun to pretend to drive a car. You don't need to make an elaborate toy car to play this game. Just get a large cardboard box and a training wheel from a bike. Then just sit in the box and hold the wheel like a steering wheel. Thats all there is to it...get playing! A Wheel (such as a bike training wheel) or a cardboard circle with center cut out. Get a box that you can sit in and you can play at driving the car. You use a left-over bike training wheel as a steering wheel. 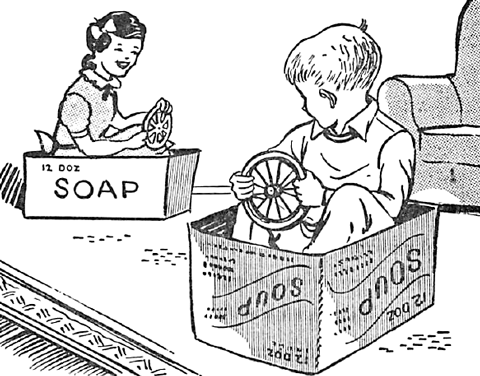 Or you can make your own steering wheel with a cardboard circle with the center cut out of it. I. We first get into the car and close the door. We start the motor. Next, we look to see if it is safe to pull away from the curb. Now we are on the road and ready to go! 2. We can drive anywhere we like. We can turn to the left or to the right. We stop and go at traffic signals. We stop and wait for folks to walk across the street in front of us. Maybe we have to honk the horn three or four times in a very narrow street. We drive up hill and down hill. 3. When we are tired of driving we carefully steer home and park in the garage.